I AM back to photography in this column, but this time the photographer is a celebrated Indian, and the age in which he lived ended a hundred years ago. Narendra Luther’s recent book, Raja Deen Dayal: Prince of Photographers, provides me with the occasion. There is an aura that has come to be attached to this name. 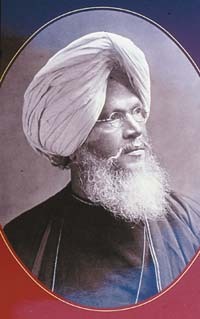 Every book on early Indian photography speaks of Deen Dayal; the title of ‘Raja’ that he carried — conferred upon him by the sixth Nizam of Hyderabad in 1895 — ensures that he is seen as being a cut above others of his times; exhibitions dedicated to his work continue to draw crowds even today; collectors and aficionados keep looking for his signatures. And, by any count, Deen Dayal’s is an extraordinary success story. Few could have foretold that this man — a Jain by birth, born in the small town of Sardanah near Meerut, not connected through family with an interest in the arts of any kind — would come to be regarded one day as the foremost photographer of India, receive a warrant of appointment from Queen-Empress Victoria, herself, be sought after by princes and nobles all over the land. Having honed his skills as a ‘picture-maker’, and endowed with a shrewd business sense, Deen Dayal founded studios in different cities — Secunderabad, Bombay, Madras, Indore, among others — that came to acquire the prestige of a brand name. India of those colonial times, with the English presence so palpable, was home to many a European photographer and photographic firm, including the renowned Bourne & Shepherd of Calcutta and Simla, and Johnston & Hoffmann. But whose photographs of that most glittering spectacle, the Delhi Durbar of 1903, does one remember and admire? Raja Deen Dayal’s, of course. Narendra Luther tells the story well, and intelligibly. Walking the reader first through the history of photography in the West and its early appearance in India, and establishing the texture of those colonial times with its swaggering sahibs and hardworking bureaucrats, he comes to Hyderabad where Deen Dayal came to settle down and won the esteem, almost the affection, of the then Nizam, Mehboob Ali Khan. 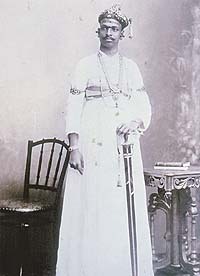 One sees a graph of the Raja’s career also through his photographs that keep company to the text: the early interest in photographing monuments and abandoned sites that brought him to the notice of men like Lepel Griffin and more than one Viceroy and Governor; an exploration of the life and times of the princes and people of Hyderabad, and so on. We do not get to know much about the kind of equipment that he used and kept adding to, or any new insights into the techniques he developed. But there are all those lavish, and crisp, images of rulers and their guests ranged along unendingly long dining tables, hunters posing with their proud feet planted upon dead tigers, monumental calligraphy in Kufic and Naskh on the walls of the Moti Masjid, the Maharaja of Rewa’s opulent carriage drawn by two elephants in the procession at the Delhi Durbar, wild-looking Rajput chiefs with eyes that look dazed by the change that has come over times, young princesses primly reclining on couches. Along the way one learns something of the business practices — and acumen — of Raja Deen Dayal himself. There is that story of how the photographer decided to engage as an assistant an Englishwoman exclusively for taking pictures of high-born women in the zenanas of royal palaces, and advertised this fact widely. Also the story of how the Raja would pick up cotton swabs dipped in a favoured ittar that the Nizam used to throw after use, and then dab the backs of his pictures before presenting them to the Nizam. This elicited the remark: "It is remarkable, Deen Dayal. You are able to bring out even my ittar in my picture!" I also found fascinating the idea of reproducing a sheet that the photographer and his assistants used to hand over to potential customers, containing ‘Hints to sitters’. Among them: "The following colours for costumes are the best to be photographed in — cream, light greys, and light tints generally. Dead blacks and whites are not so good. Dark reds and browns, heavy greens and yellows come out nearly the same as blacks." And the USP of the studio: "Although babies and children often occasion much trouble and require a large number of plates, we make no extra charge. The book is rich in photographs. But what the reader might find a bit confusing is how photographs taken by Deen Dayal, and those taken before his times or after, all mingle and jostle against one another, with no clear guide provided to authorship. I wish that the photographs had all been of even quality, at least even sharpness. The fuzz and the grain that second or third generation reproductions often acquire cast a less than fair light upon the originals. In the end, a word about the epigraph with which Narendra Luther’s engaging book opens: a couplet in Urdu that the sixth Nizam himself composed in honour of the photographer. As it is reproduced, it reads: "Ajab yeh karte hain tasvir men kamaal kamaal/Ustadon ke hain ustad Raja Deen Dayal" (In the art of photography, surpassing all,/A master of masters is Raja Deen Dayal.)" As far as I know, the original, at least according to the Farhang-I Asifiya, read: "Ajab yeh karte hain tasvir mein kamaal kamaal/musavviron ke hain ustad Lala Deen Dayal". I point this out not only because "ustadon" in the couplet as cited does not fit into the metre, producing a sakta as Urdu knowers would say, but because replacing the word musavviron (painters) with ustadon (masters) robs the couplet of the fine reference to the comparative arts of painting and photography. What the Nizam said was that this gifted photographer is far ahead of the painters, and can teach them a thing or two! Which he could perhaps, given the state to which painting had been reduced by that time.